New research shows that the adoption rate of advanced analytics is on the rise, with more than 70 percent of firms indicating their company is actively using or has near-term plans to use analytics in their everyday decision-making. The study, which was commissioned by Dell Services and executed by the International Institute for Analytics (IIA), suggests that the majority of companies have just scratched the surface when it comes to how they leverage advanced analytics. In fact, the research shows that only 5 percent of early adopters believe that they have achieved the highest level of analytical maturity. Additionally, the research found that many respondents expect to gain a competitive advantage in the future due to successful data mining, with more than two-thirds strongly disagreeing that analytics are a fad. 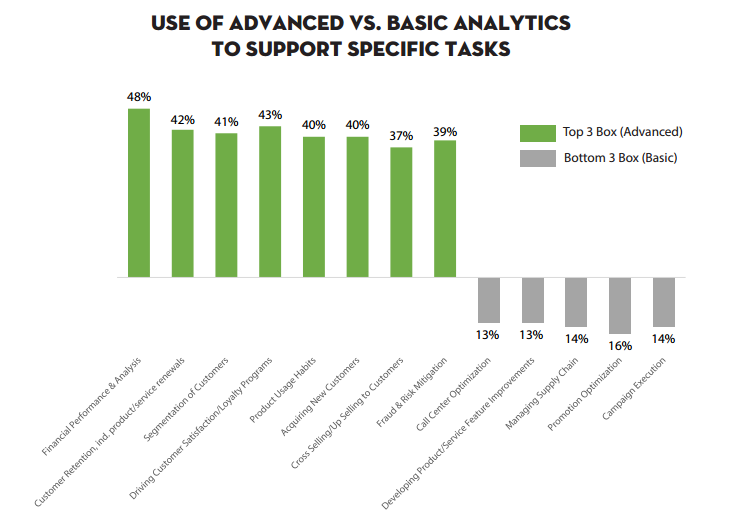 Moreover, respondents are using advanced analytics for a variety of tasks, with almost half noting they are using the data to predict their company’s financial performance and about 40 percent leveraging advanced analytics for a variety of different tasks, such as customer recruitment, retention, loyalty programs and product usage habits.